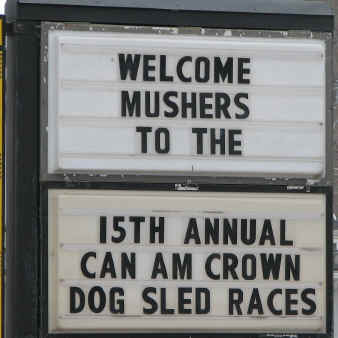 Termed by many as the Iditarod of the East or the most grueling race on the Eastern side of North America, the Can Am is in fact three races in one, the 30 mile 6 dog, 60 mile 8 dog and the elite 250 mile 12 dog race. 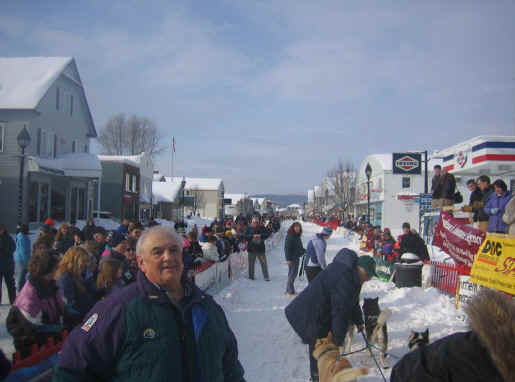 All three races begin in Downtown, Fort Kent in northern Maine on the first Saturday morning in March and finish at the ski lodge in Fort Kent at varying times over the next 4 to 5 days. entire winter in the garage meant that 2 weeks before we were due to run in the Can Am 30 we pulled out citing lack of sled experience and most importantly extreme lack of training and preparation for the dogs – that turned out to be the best decision we made the whole winter; as we found out the Can Am truly is a grueling race and not the place for an under prepared team. 30) we set off on the 8 hour drive to Fort Kent on the Thursday before the race. 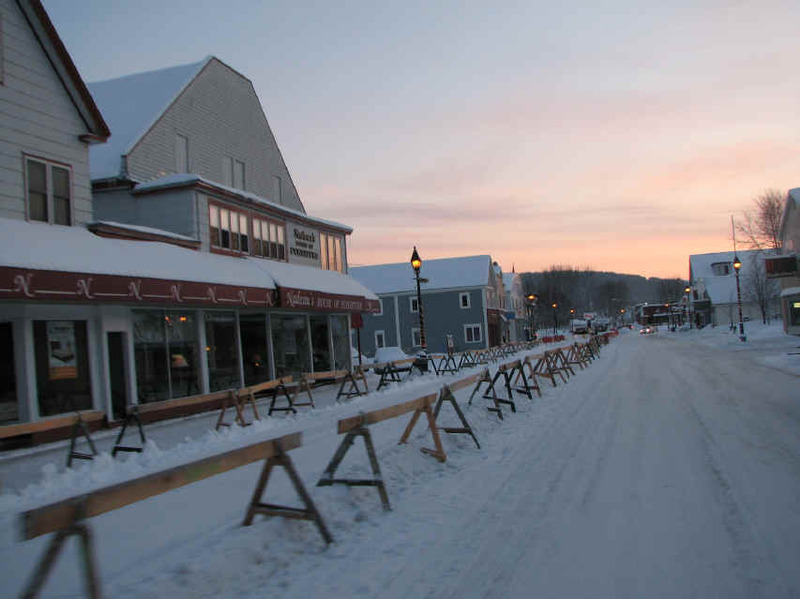 winter came back with a vengeance on the Friday morning, 24 hours before our biggest race ever. The van was consistently proving incapable of surviving in the extreme cold and on the Friday morning, after night time temperatures down around the –20°C mark, repeated failures to start was followed by a rather large oil leak and then almost immediately by a stream of fuel pouring out of the back of the engine. 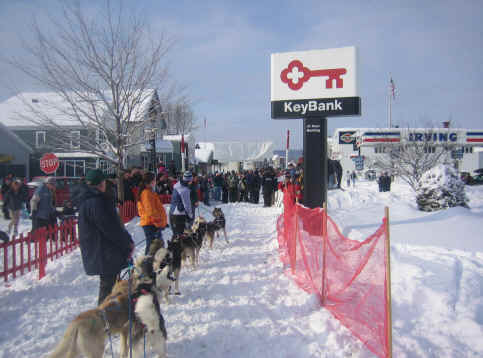 Although 24 hours from the official start of the race we still needed to get all the dogs up to the ski lodge to register and have the dogs examined by the vets. At 1400 hours when we were supposed to be at the ski lodge registering the team we were sat in a garage in Fort Kent watching a mechanic who admitted to having never seen a VW van before, strip down the engine and fuel pump. out very grim faced - "Its still leaking" he said, my heart sank completely - I was going to scratch, enough was enough. "No, I'm only joking, its good" he smiled; I guess I may have smiled back at him too. 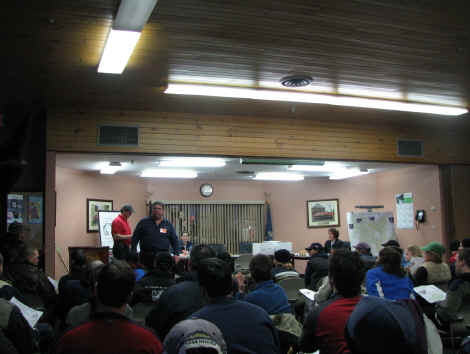 To cut a long and tedious story short the mechanic had performed miracles, we raced up to the ski lodge, registered for the race, all the dogs passed their checks (although I thought Poppy's shoulder injury incurred earlier in the year was going to come back and haunt us), we listened intently at the mushers meeting (only slightly daunted by all the mushing experience in the room) and all that was left was to get a good night's sleep - fat chance. I had been surviving on 4 hours sleep a night for the previous week, waking up every time the dogs refused to leave the starting chute, or when they left but with me lying in the snow behind them. We had resolved that Poppy and Fya would lead the team out of Fort Kent and although I had real concerns about either of them running at lead they were the dogs that were least likely to baulk at the 3000+ people forecast to line the streets. Nonetheless the decision to go with experienced dogs at lead didn't ease my concerns or allow me to sleep any better and so at 0530 on Saturday morning, after another restless night, we arose to race day. wandered off to wish Tara and Becki luck (both also Can Am novices and both running in the 30 - how I wished I was running in the 30) and to steal Tara's friend and handler, Ray, to help get us to the starting chute. As we watched the first teams get underway I made the decision, I turned to Louise and announced that I was running Paris at lead, when my reply to her query as to whether this was Paris and Fya or Paris and Poppy (remember the decision based on restless nights) and my reply was "Don't be daft, Paris and Medea", I was going to lead out with two yearlings, one the youngest dog on the team and the other not at all comfortable around people and especially noisy crowds. Louise looked at me as if I had finally gone mad - I think by this stage I probably had. further and try to eat the boots. Having got all the other dogs hooked up I climbed back in to the van to sort out Hektor, as I opened the cage door he came flying out, head butted me just below the chin and knocked me back across the van and into the other cages. I picked myself up as best I could and then for what seemed like an eternity we played the game where I tried to get the harness on Hektor and Hektor tried to get out of the van. I won the battle (just) but Hektor won the war - I was not going to try booting him at least until we were on the trail, out of town and he had used up a bit of his energy. chute. Two minutes until complete embarrassment, I'm going to fall off, the dogs won't run, they'll be petrified of the crowds - why oh why did I go with Paris and Medea at lead, there is no way they will get through these crowds. Last minute hugs for the dogs, good luck wishes from everyone, onto the runners and away. As soon as we cleared the starting chute a small girl yelled in excitement, in that split second it was as if my vision tunneled completely and all I could see was Medea at lead - she flinched and noticeably veered to the right, my heart sank - the nightmares were coming true, we were going to stop or worse still throw me off. And then a change, a wave of confidence seemed to surge backwards from Medea and Paris at lead and as it washed over me we picked up speed and nothing was going to stop us getting out of town now. I relaxed on the runners, started waving back to all the well wishers and even found my voice to reply to the cries of "Go Canada" with "Go Britain". We swept down towards the river, under the bridge up next to the semi-frozen river and back up and across the road. Before I knew it we were making a gee onto the Heritage Trail on the outskirts of town and, for us, setting quite a reasonable pace despite the fact that I was using the drag mat mercilessly to keep the speed down - wow this was easy!! last. Not to say of course I wasn't also passed, even before we had got off the snow mobile trail and onto the more challenging Can Am trails proper I had already been overtaken by at least 4 other teams but I was used to that, especially as they were all hounds or alaskans - still I wasn't going to be last!! A bit of misplaced exuberance perhaps especially when there was still about 56 miles of trail ahead of us. "Oh no, worse, much worse and it keeps going like this for about the next 26 miles", his voiced tailed off as he pushed into the climb. Not wishing to speak anymore, probably because I couldn't, I didn't ask him to confirm that I had indeed heard him incorrectly and he had actually said 2.6 miles. We pushed on. was a warm day and I was convinced the surface ice was melting. As soon as the musher and her team had gone by I was off, she hadn't called trail or asked me to wait and was undoubtedly a lot faster than me –and so we were getting off this lake now. Talking to some of the teams the next day they had faced similar problems on the lake crossing, the snow was very wet in the middle but completely safe but for me out on the trail as we climbed the opposite bank and rose back into the forest another fear that had plagued my mind for the previous week was vanquished, we weren’t going to drown in open water. dropping at I was gong to be lucky to finish in 12 hours. To make matters worse, on occasions the climbs got so hard and the snow was so deep that my legs locked up, the muscles in my thighs refused to cooperate even to the point that all I could do was stand on the runners and hope the dogs would get us to the top of the next climb. I buoyed myself with the knowledge that I wasn't last, there was still the team I had overtaken and the other team that was due to start immediately after me still hadn't passed me. All was not lost - unless of course they had both scratched!! Of course they have both scratched, that can be the only explanation. trail – hell there was no one behind me now in the 60 mile race, I could snack anywhere on this section. 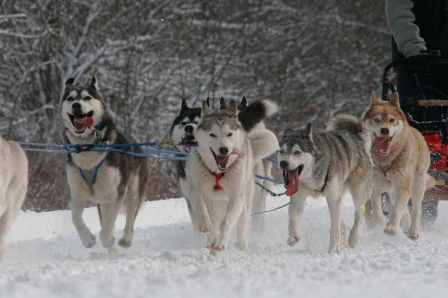 I opened the toe bag on the front of the sled and reached in to grab the tuna laced ice cubes that would give the dogs some water, what emerged from the sled was a bag of tepid water with tuna pieces floating in it; all three bags of ice cubes had melted. I felt that I needed to get some fluid into the dogs so poured out a small amount of the mixture into the snow in front of each dog, they all ate gleefully taking in snow with the tuna – well something had worked at least. I climbed back on then calling up the dogs and as soon as I popped the hook we were off again. one “I am absolutely knackered” I responded, “Oh don’t worry the last 30 miles are so much easier than the first 30” he said, smiling knowingly. I detected a hint of amusement in his voice, “Do you really expect me to believe that” I quipped and then they too were gone and once again it was just me, eight best friends and the trail ahead. themselves to run whilst the sled sat in the ruts at an angle of about 45° with me contorting my body to try to maintain some sense of stability. As the slope got steeper and speed increased even more, thoughts of maintaining balance were replaced with thoughts of maintaining life – there was no point in shutting my eyes, all I could see anyway were the flashing collars of the leaders so I just hung on for dear life. At points the depth of the ruts coupled with the angle of the sled meant that even when pushing the brake fully down I was not contacting snow. Then just as I was sure I was going to die, the descent leveled out and we came to a road – the first sign of tangible civilisation in over 9 hours. top and take the immediate turn to the left. I swore again, pumped my legs one last time, tried to swear again, wheezed one last breath and then sled and musher joined the team at the summit. By the time I had regained position on the runners and managed to lift my burning chest off the handlebar we were picking up speed once again. As my eyes focused I could see netting, and people and lights and most importantly a banner across the trail with the marvelous words FINISH written across it. and pull out items on demand. Finally the last item checked off, the vet said that the dogs were looking really good and ready to keep going, Louise led the team down the hill, away from the trail and in to the car park. spent 800 miles and god knows how many hours together over this winter but today the nine of us had finally become a team. Back at the hotel some friends we had made on Boot Camp came up to congratulate us for finishing and to invite us out for a Chinese. We thanked them on both counts and said we would probably meet them at the restaurant after we had fed the dogs and let them out for a stretch. 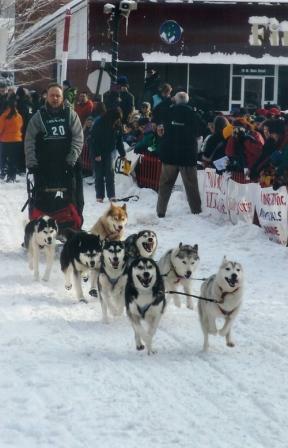 After feeding the dogs however I lay down on the bed in the hotel and my body told me we were not going anywhere that night; I slept the sleep of an exhausted but contented musher. despite the fact that we had achieved the goals I learnt a lot of valuable lessons in the process; our three year plan could be extended and revised. Nonetheless looking around the packed hall, filled with smiling faces, I felt a huge sense of achievement, we had completed our first 60 mile race, the dogs had finished strongly and not only were we not last there were in fact three other teams behind us. I smiled then and I think I kept smiling for the whole of the 8 hour drive home. Even now whenever I look at Paris and Medea I feel a huge welling up of pride inside, I had read about these bonds between musher and lead dog but never really understood what it meant, the Can Am 60 has started me on the road to understanding and truly developing that bond. The most grueling race in the east of North America? For me certainly this has been by far the most difficult race to date. The Iditarod of the East? 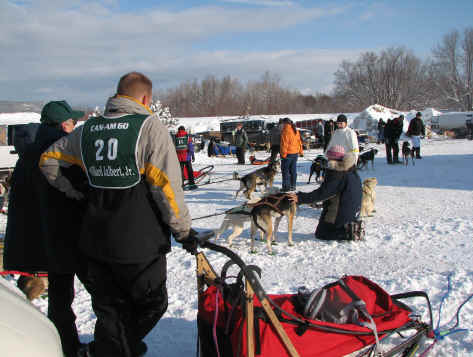 Who am I to comment; I will say however that the winner of the 2007 Can Am 250 and an Iditarod veteran was heard to say that the hills on the 250 course were worse than anything on the Iditarod. Looking forward to the 60 next year? I wish I could say yes but I know what to expect now – I am looking forward to seeing how much the team have improved by. A massive sense of achievement? You had better believe it!